This Registration Type has a very special use case. It was developed to allow families attending a special service, such as Easter worship service or July 4th celebration, to use their mobile devices to register their attendance. You would either display the registration link on the video screen or put it in your bulletin, and ask one person from each family in attendance to use that link to easily find one person in the family. When he finds someone in the family, he will also see a list of his other immediate family members displayed. He will just check the box beside each family member who is in attendance. The person can also log in if he has a TouchPoint user account and record his family’s attendance. The person who has either found his own record or who has logged in, will be named at the top of the page and will also be in the list and automatically marked present. All other family members will be listed as well. Mark only those who are actually attending. If you use this during a service and display the URL for people to use on their mobile devices, you might want to remind everyone to have only one person from each immediate family register his own family. Also, remind them not to register their adult children, especially if those adult children are in the database in their own families. What will happen in that case is that those adult children will have new people records created for them and those records will be added to their parent’s family unit. 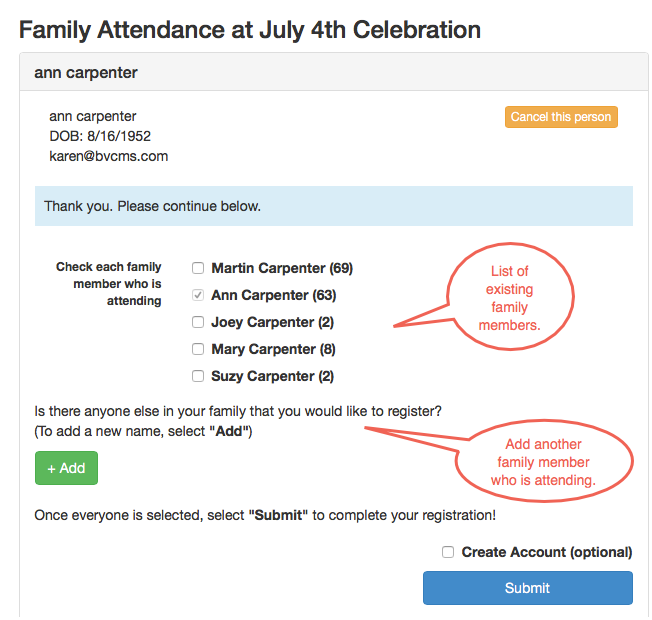 The person registering has the option to add another family member that is not in the list, but who is attending. This will always add a new record and the person will always be placed in the family of the person who has either logged on or has found his own record. This was designed to be super-simple, so it bypasses the look-up phase of a normal online registration when you are adding another family member and instead allows the person to create a new record right then. When adding a new person, a minimum amount of information is asked for: Name, DOB, Gender, Marital Status, Email. The family address and phone number will be used on this new record. For guests who are attending and who are not in your database, each one will enter basic information (First Name, Last Name, Phone #, Email) and then be presented with a page asking for more information including street address and phone number. Guests will also be able to add their family members and register their attendance. Every person they add will be placed in the family with the person registering and will use that family’s address. - Registered This is the individual that found his own record. - Attending This is everyone that is checked as being present, including the person who registered them. - Added This is any new record that is added, to let you know it was added during the registration. There are other use cases for this Registration Type, but remember, it was designed for this purpose. You cannot add questions like a normal online registration, however, it will trigger a confirmation email to the person who registered his family. So, be sure you have created the Confirmation Email and that you have an Online Notify Person selected. Because this is streamlined version of registration, expect some duplicate records. So, have your System Admin run the Find Duplicates process after this type of registration.